Dear Visitor, these book are our English Grammar books for the Turkish market or the people who knows Turkish and want to learn English with a Turkish explanation. Therefore, all the information on this page is in Turkish. If you would like to get more detailed information about our books, please contact us at the e-mail addresses below. 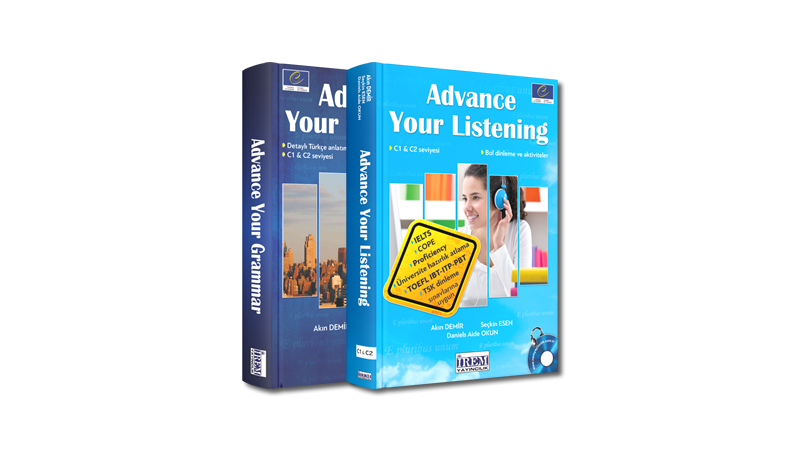 ADVANCE YOUR GRAMMAR ve ADVANCE YOUR LISTENING kitaplarımızı incelediyseniz ve İKİ kitabı beraber satın almak istiyorsanız, buradan satın alma işlemini gerçekleştirebilirsiniz. Advance Your Listening - C1 & C2 seviye DİNLEME becerilerini kapsar ve yaklaşık 10000 activite bulunur.